Standard - $334.99 X-Large - $334.99 Only 4 left! You weren’t sent here from the planet Krypton, and you certainly do not get any kind of superpowers from our yellow sun. And last we checked, you can’t fly, you don’t have super speed or super strength, and you definitely can’t shoot lasers from your eyes. But none of that means you don’t care about saving our planet! You recycle and compost, you drive a low emission car but try to bike or walk everywhere you go, heck, back in 2010 you even went down to the gulf to help clean up the oil that made its way all way to shore. You know what, by our standards you are a superhero, so this Halloween, why not don the get up of the best defender of Earth of all time, Superman himself? We think you deserve it. In this Grand Heritage Dawn of Justice Superman Costume, you’ll take on the exact look of the protector of truth, justice, and all that from the Zack Snyder film, Batman v. Superman. 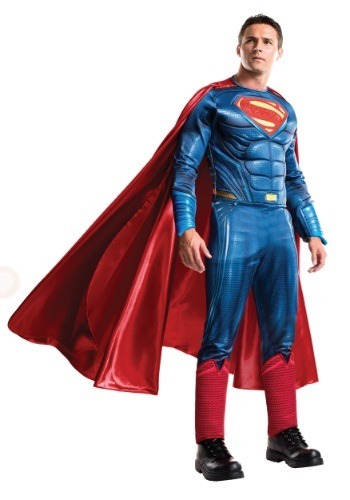 The high quality detailing in the molded and painted latex Superman logo and full jumpsuit will make you feel right at home as the alter ego of the Daily Planet reporter Clark Kent. Our only bit of advice: just watch out for that Batman, because he does seem to have it out for you. Being Superman isn’t an easy life, but you’re the kind of person who takes whatever road leads to the right thing to do.